Some of you may know that there are a few actors I will make an effort to see in every stage show they appear in. Kevin Spacey is such an actor. I remember watching Speed the Plow several years ago for exactly two reasons: Firstly it was staged in a theatre in Germany not too far from my home so for once I didn’t have to board a plane to watch a show. Secondly it starred Jeff Goldblum, one of my all time favourite actors. I sat down in my seat ready to be amazed by Jeff Goldblum’s performance. And yes, he was great in that show! However, I ended up raving about the other male lead in the show – you may have guessed who it was: Kevin Spacey. 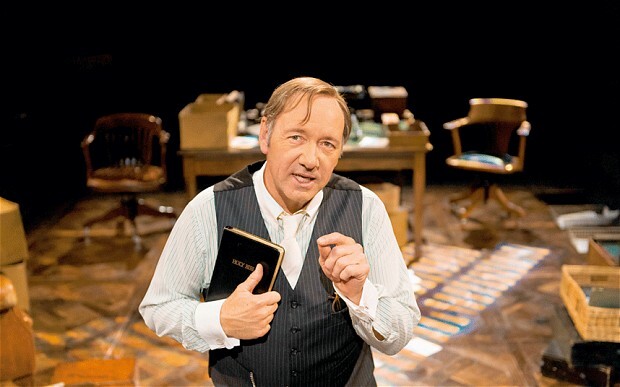 I first watched Kevin Spacey play Clarence Darrow in the 2009 Old Vic production of Inherit the Wind. And he portrayed the famous American lawyer brilliantly back then but this time he was facing a new challenge. 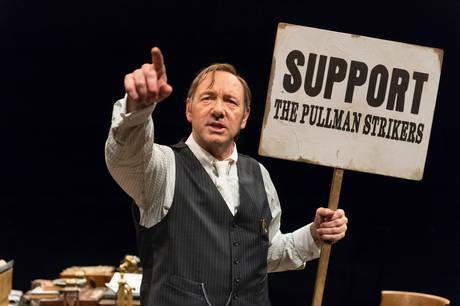 First of all, Clarence Darrow is a one man play and from my experience Kevin Spacey is at his best when he has someone to interact with on stage – an equal counterpart so to speak. On top of that the Old Vic has been transformed and Spacey therefore has to perform in the round. So yes, I was a bit apprehensive at the start of the show – for about one minute. The moment Kevin Spacey appears on stage with a slightly sagging walk he commands the whole auditorium. His Clarence Darrow is loud and confident, a man who knows what he is capable of and how to achieve what he wants. Yet he is also a man who is on the verge of losing faith in the one thing he believes in the most: The law. We learn about Darrow’s most famous cases, from defending a black doctor who was protecting his family against a “white mob” to the well-known monkey trial (on which Inherit the Wind is based on) and the defence of Leopold and Loeb, the thrill murderers. There’s not much talk about Darrow’s private life but that doesn’t make the play less gripping and Spacey’s portrayal of a man who prides himself on saving 102 individuals from the death penalty is one of the most mesmerising performances I have seen on stage in a long time. Kevin Spacey not only manages to draw a lasting and powerful picture of Darrow, he also engages the audience – shaking hands and addressing individuals. I didn’t know much about Clarence Darrow but after watching this play I have learnt that he was a man who stood up for others and for himself, someone who strongly opposed the death penalty and who would do anything in his power to save even those guilty of crimes from such fate. He was a man who lived almost exclusively for his profession, a profession that seemed to eat him alive at times. If you are lucky enough to have a ticket for one of the remaining performances: Well done! You are in for a treat. Everyone else should consider getting up early and queue for day seats (there are 20 for each performance). This play is worth a little lack of sleep. Clarence Darrow is on at the Old Vic until 15th June 2014. More info here.